Semiconductor materials are unique among laser gain materials for their extremely high index of refraction. As a result of this large index difference at the air/semiconductor interface, each facet of a laser diode naturally acts as a partially reflective mirror (~32%). This gives diode lasers the unique property of having a built-in resonator which is capable of lasing without any external optics or coatings and providing an extremely low-cost solution for applications such as laser pointers, where performance isn’t the primary concern. For higher power applications the rear facet of the laser diode is typically coated with a dielectric material to increase the reflectivity to over 90%. This HR mirror dramatically reduces the gain threshold while simultaneously increases the useful power out of the front facet (or output coupler). This approach works exceptionally well for producing compact, low threshold, high-efficiency, monolithic, high-power, single emitters, and diode bars. However, having such a low gain threshold results in an extremely unstable spectral emission profile. In our previous blog post titled “Stabilized vs. Unstabilized 976 nm Fiber Laser Pump Lasers” we discussed the importance of stabilizing the wavelength of laser diode bars for increased fiber laser pumping efficiency. In this post, we will talk in more detail about how this is accomplished, and the effects of the laser diode facet coating on performance. Before we can fully understand the impact of the facet coating, we first need to understand the dependency on the longitudinal mode structure and cavity loss (gain threshold). The figure below does an excellent job of illustrating the interdependencies of the materials gain bandwidth, the laser cavities mode spacing, and the cavity losses. 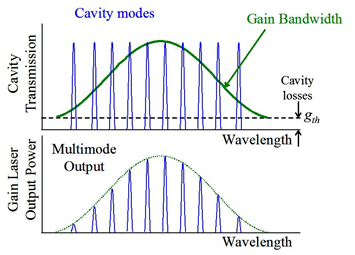 From this, we can see that the wider the gain bandwidth and the lower the cavity losses, the more longitudinal modes can lase simultaneously, but what it does not show is that the gain bandwidth itself will vary with temperature and drive current. As a result, these lasers will not only produce multiple laser modes simultaneously, but those modes will vary under normal operating conditions. One standard method for getting around this issue to stabilize the output of high-power laser diode bars is to apply an additional AR coating to one or both of the facets, and use an external resonator cavity to control the gain threshold and mode spacing actively. While technically both facets can be AR coated, and an external high reflector used, in practice, the vast majority of external cavity diode laser systems utilized an HR coated back facet and an AR coated front facet. This method has been around for many years for lower power tunable diode lasers using configurations such as Littrow and Littman-Metcalf, but for the stabilization of high-power diodes bars for pumping applications, tunability is not usually needed. For these applications, volume Bragg gratings (VBG) are the ideal choice for the output coupler because they allow you to increase the reflectivity at one specific wavelength, while simultaneously causing the gain threshold to be high at all other wavelengths across the gain bandwidth. Additionally, due to the low coefficient of thermal expansion of glass the VBG’s bandwidth tends to remain constant regardless of temperature and current allowing the diode bar to be driven at different powers without causing a noticeable shift in the lasers spectral output. Here at RPMC, we offer a wide variety of diode bars from Jenoptik which are available with optional low AR coatings (> 0.3% typical) for integration into external cavity lasers. These InGaAs-based semiconductors are available with wavelengths between 760 nm to 1030 nm and with output powers up to 200 W continuous wave (CW) and 500 W quasi-CW. For detailed technical specifications on our unmounted laser diode bars from Jenoptik click here, or talk to one of our laser experts today by calling 1-636-272-7227.